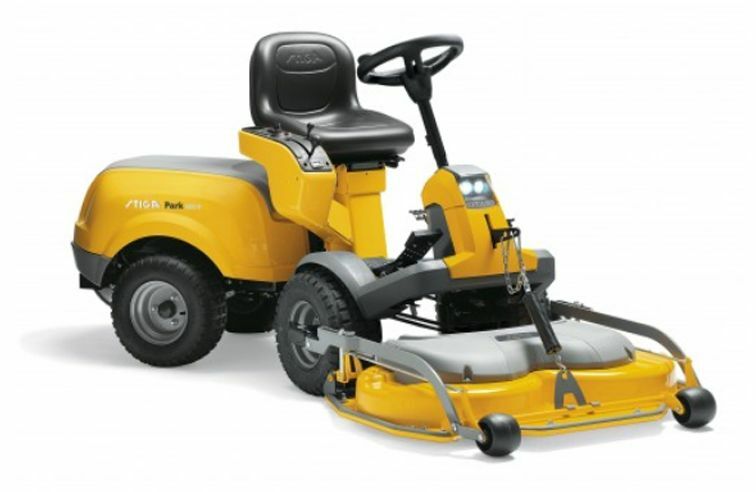 This Park 520 P has all the features you would associate with a Stiga Park; articulated steering, front mounted cutter deck, hydrostatic drive, a comfortable adjustable seat, adjustable steering wheel, and ergonomic controls. It also features mechanical servo assisted steering, another innovation from Stiga, which provides extra light steering control, so working around obstacles is even easier. With the Park 520 P you have a powerful smooth Briggs & Stratton Intek 4185 engine, excellent all round visibility, and it gives a top class finish! Mowing around trees, in and out of corners or under bushes are a breeze as the unique articulated steering system means the rear wheels will always follow the front wheels. There's no need to worry about the back of the machine catching on anything. The hydrostatic drive gives you full control of your ground speed, simply press the foot pedal forward to move forward, or backwards to go into reverse. The more pressure you apply, the faster your speed - take your foot off the pedal when you want to stop. Choose either a 95cm (£575), 100cm (£805),105cm (£695) or 110cm (£1165) working width Multiclip Combi cutter deck. With ten preset heights of cut and recycling or rear discharge modes, you can be sure of getting the ideal finish in all types of grass and working conditions. Stiga produced their first Stiga Park in 1974. It was a revolutionary product with genuine articulated steering, which allowed the machine to bend in the middle and a front mounted cutter deck. This afforded it amazing manoeuvrability and visibility. The principles of this design still exist in the Park range today - functionality, reliability, comfort, quality and care of the environment. Built today, for tomorrow, all models come with a 3 year warranty on the mower and a 10 year warranty on the chassis. Wheels Front 16" Rear 16"